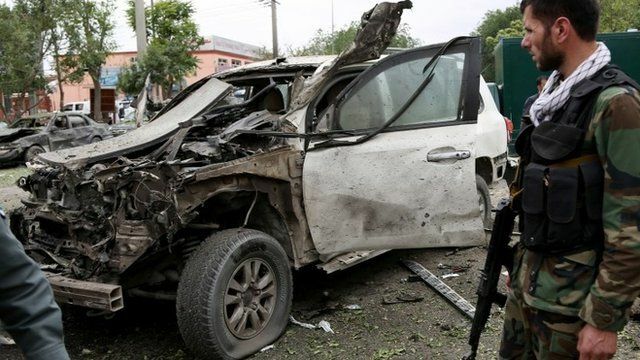 Abdullah survives Kabul bomb attack Jump to media player Afghan presidential front-runner, Abdullah Abdullah, has survived a bomb attack in Kabul. Obama defends prisoner exchange Jump to media player Barack Obama has been defending his decision to free five senior Taliban militants in exchange for a US soldier who was held captive for five years in Afghanistan. US soldier freed by Taliban captors Jump to media player A US soldier who has been held by the Taliban in Afghanistan for nearly five years has been freed in deal that includes the release of five Afghan detainees, US officials have said. Calais migrant: 'I will go to sea again' Jump to media player Among the migrants trying to get to the UK from the French port city of Calais is the man who made headlines earlier this month, when he set sail on an improvised raft to try to cross the Channel. US hands over 'huge key' to air base Jump to media player An official closing ceremony has been held at the US air base in Kyrgyzstan. Abdujalil Abdurasulov reports. US presence 'depends on Kabul pact' Jump to media player President Barack Obama says plans to keep 9,800 US troops in Afghanistan next year, depends on the Afghanistan government signing a long-delayed agreement. Afghan presidential front-runner, Abdullah Abdullah, has survived a bomb attack in Kabul. Speaking on national television, Mr Abdullah said two explosions struck his convoy as it was leaving a campaign event in the city. Four people have been killed in the attack and at least 16 injured. Mr Abdullah, a former foreign minister, is the favourite to win Afghanistan's presidential run-off election later this month. Daud Qarizadah reports from Kabul.